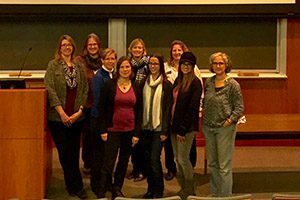 Nine Warwick Valley teachers participated in the fourth annual New York State Master Teacher Program’s (NYSMTP) Demo Derby, held Saturday, Nov. 18, at the State University of New York at New Paltz. The Demo Derby, hosted by the Mid-Hudson Master Teachers’ Student Engagement Professional Learning Team, is a chance for teachers to share ideas and showcase creative ways of introducing a topic, reinforcing a lesson, and engaging students. Nine Warwick Valley teachers attended the Demo Derby, held Nov. 18 at SUNY New Paltz. Master teachers are recognized for their dedication to providing the most innovative STEM education to their students, their commitment to professional growth, and their enthusiasm for sharing their successful practices with colleagues. The NYSMTP introduces motivated teachers to like-minded professionals who meet regularly to collaborate, learn, and share with their peers. The Demo Derby is an extension of this effort.